The only closure normal citizens will ever get on the MH17 tragedy has already been revealed. We will never know for certain who is responsible for the deaths of 298 innocent passengers. As sad a reality as this is, the world must come to accept it. A year of propaganda and misdirection has confounded the public over Malaysia Airlines flight MH17. At this point it seems obvious; this was a sort of “strategy” all along. The question that has haunted me since the beginning is, “Why do both sides seem content to let the drama play out?” No matter what the Dutch Safety Board, or the Joint Investigative Team (JIT) report, it will be unbelievable. One haunting fact of this case remains though, many knew what happened from the beginning. Here’s my theory as to “why” we cannot know all the facts of this case. All of you reading this will have already familiarized yourself with the “evidence” on flight MH17. The case of the doomed airline passengers aboard the plane has been aired out in the court of public opinion. The situation we’re in now reminds me of another famous trial. The prosecution of dishonored NFL Football star O.J. Simpson over the death of his wife Nicole. The media has made a circus of this tragedy, and the blood of 298 human beings will never be avenged, justice will never be done. That said, we do have evidence as to “why” we know so little. It is circumstantial evidence I’ll grant you, but the logic follows if you will bear with me. When I first learned of MH17 being shot down over separatist territory in East Ukraine, I instantly thought “provocation”. I cannot explain why exactly, but rebels holed up, backs to the wall, they just never seemed capable of the crime. As for the BUK missile launcher and the Twitter frenzy, the spliced and diced YouTube “proof”? Well, I can make a mashup to show anything, given the time and money. From the US State Department, The White House, and even from the Kremlin it was crystal clear the “day of” the incident, something was being hidden. To add to this, MH17 became a political football in the United States and abroad. The end fighting and posturing of officials like Senator John McCain and former Secretary of State Hillary Clinton, it muddied the waters even more. This report from the Mail Online paints President Barack Obama as incompetent, according to McCain at least. Meanwhile the Die Welt story the day of the incident assures Germans the US “secret” agencies knew it was a “surface-to-air” missile which downed the plane. The got their “intel” from the American Federated Press (AFP) the same day! If one observes simply the “timing” of statements and reports in this case, then the whole carnival becomes surreal. How could the AFP be on top of a story so fast? What does it take communications wise, for Yahoo! News to carry joking passenger blurbs before the sun set on dead bodies in the Donbass? You were all here, live on the Internet, Tweeting and blogging, “liking” this Facebook mention or that, and watching the news unfold on CNN, FOX, BBC, and RT. When did your “BS alarm” go off first? Mine went off as soon as I heard Ukraine’s security services had already produced what they said were two intercepted telephone conversations that showed rebels were responsible. Then within a few hours the faked videos began arriving on the social media scene, followed closely by State Department rhetoric to match. Then Secretary of State, John Kerry’s “drunken separatists” at the scene of the crash, it was clear the was a lot of “story building”, as we call it in our PR practice, going on. But the one story not rising from the ashes of MH17 was the military intelligence version. Those humongous intelligence gathering capabilities we’ve come to know, the NSA, GCHQ, space weapons galore, and the capability to see anything on or world via Google Earth even, there was utter silence from there. The most costly and controversial technologies every devised by humanity, arrayed to start, or to prevent any chance of World War III being a surprise – these proved useless, when the capability was most needed. Useless! The reason we cannot know what happened to MH17 involves two aspects. First, any credibility on either side of this puzzle has long since been destroyed. It is my belief this has been by design. This brings us to the second point, unwillingness to reveal the true intelligence and military capabilities of the United States, and of the Russian Federation. The short version of this theory is, neither side can reveal the capabilities at hand to show proof of who killed MH17. Not to be the “all knowing” analyst here, but I suspected this all along. Then the Russian Ministry of Defense released the only credible explanation thus far. This report is important for several reasons, not the least of which is that none of its contentions have been adequately challenged on an official level. Of the report, I can say it was the ONLY attempt so far, from ANY military or other official source. This leads to my earlier question, and the supposition that “capability” is being hidden. I can make several points here that support my theory. First, General Kartopolov and the Russian Defense Ministry made this report based largely on civil radar information from regional air traffic control in Rostov. While understandable, the use of civilian radar and satellite imagery instead of highly advanced Russian air and space defense units in the region is telling. Even though the ministry goes farther than the Americans in compiling a plausible explanation, much lays hidden beneath the veil of measure-countermeasure strategic capability. It is in scrutinizing so-called Russian Aerospace Defense Forces, that the whole US vs. Russia information strategy over MH17 can be understood. I’ll briefly explain. Assuming the US and Russia mutually possess similar strategic and intelligence capability, we can begin to understand why the MH17 downing was not solved early on. Neither nation can afford to reveal the depth of technologies involved or the lack of capability if there are shortcomings. It is my belief that certain “technology leaps”, may well negate any possibility of Russia coming through with damning satellite imagery of this crash. By “leaps” I simply mean, showing high resolution media or imagery of the event (for instance) would betray “exact” military capability to the Americans. The fact that Aerospace Defense Command has a station North of Ukraine in Hantsavichy, Belarus that watches everything that moves near Russia, opens up this whole discussion. This “Volga” class radar facility is mostly secret, but obviously capable of identifying the launch of any missile anywhere in Ukraine. However capable these controversial ABM era systems may have been though, the more advanced Voronezh radars’ advancements virtually assure the MH17 event was framed like a Van Gogh handing in the Louvre museum. And neither Russia, nor America will be willing to be seen betraying ABM missile treaties, let along total military capability in space at this stage of the game. Suffice it to say here, that advanced phased array UHF and VHF radar overlap in Russia and within the Joint CIS Air Defense System can detect an object the size of a soccer ball flying in pitch dark blackness. This does not even take into account General Kartopolov’s hinting at the recently deployed Space Based Infrared System (SBIRS) by the US, nor does it tell of Russian Air and Space Forces having delivered “mysterious” payloads (satellites) into orbit in 2014. Whether or not the alleged Kosmos-2499 now in orbit is a “ghost” killer satellite, or not, is irrelevant. We would be naive to believe Russian or American generals are not at war constantly, on the drawing board at least. We have no need here of dissecting the capabilities of active electronically scanned array (AESA) radar systems, space based weapons, or other technological advancements in the US or Russian arsenals. The probability any missile was launched at an airliner near Russia territory unnoticed electronically, is virtually impossible. What is more likely, are the technology “gaps” I mentioned earlier having the effect of stalemating this investigation. Russia cannot show the missile or aircraft cannon riddling MH17 with projectiles, and neither can the Pentagon. Both capability and weakness can be revealed in IMAX-like video of the plane being hit, and then falling to Earth. Let’s be clear here. 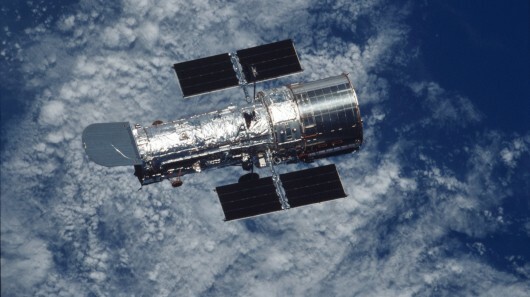 This report deals with so-called “space based” early warning systems. The radar systems I have previously discussed are land based. So you see a point of “vulnerability” in this one instance. By the nature of MH17 evidence provided, should Moscow be determined to reveal, the United States and NATO would gain advantage. Either Russian EWS capabilities might be given away, or gaps in the missile defense systems of the entire country could be discerned. I could find no data yet on the new satellite imaging capabilities of Russia via programs like the recently launched Kondor satellite, or a new program under construction by Lavochkin Aerospace. These newer satellite systems have sub-meter optical resolution capability, which would be on a par with current US capabilities. Regardless of such capability, revealing it is another story militarily. It is in this realm of strategic intelligence, where the truth about the downing of MH17 has been stymied. At least this is one theory that has not been adequately explored in my view. Now as to ultimately responsibility for the MH17 tragedy, we can still only speculate as to where the US or Russia has more to lose or gain form supplying the full picture. We only have America’s unusual insistence Russia is somehow guilty, and without any real proof. Wall Street and the Matrix: Where is Neo When We Need Him? In the Matrix in which Americans live, nothing is ever their fault. For example, the current decline in the US stock market is not because years of excessive liquidity supplied by the Federal Reserve have created a bubble so overblown that a mere six stocks, some of which have no earnings commensurate with their price, accounted for more than all of the gain in market capitalization in the S&P 500 prior to the current disruption. In our Matrix existence, the stock market decline is not due to corporations using their profits, and even taking out loans, to repurchase their shares, thus creating an artificial demand for their equity shares. The decline is not due to the latest monthly reporting of durable goods orders falling on a year-to-year basis for the sixth consecutive month. The stock market decline is not due to a weak economy in which after a decade of alleged economic recovery, new and existing home sales are still down by 63% and 23% from the peak in July 2005. The stock market decline is not due to the collapse in real median family income and, thereby, consumer demand, resulting from two decades of offshoring middle class jobs and partially replacing them with minimum wage part-time Walmart jobs without benefits that do not provide sufficient income to form a household. No, none of these facts can be blamed. The decline in the US stock market is the fault of China. What did China do? China is accused of devaluing by a small amount its currency. Why would a slight adjustment in the yuan’s exchange value to the dollar cause the US and European stock markets to decline? It wouldn’t. But facts don’t matter to the presstitute media. They lie for a living. Moreover, it was not a devaluation. When China began the transition from communism to capitalism, China pegged its currency to the US dollar in order to demonstrate that its currency was as good as the world’s reserve currency. Over time China has allowed its currency to appreciate relative to the dollar. For example, in 2006 one US dollar was worth 8.1 Chinese yuan. Recently, prior to the alleged “devaluation” one US dollar was worth 6.1 or 6.2 yuan. After China’s adjustment to its floating peg, one US dollar is worth 6.4 yuan. Clearly, a change in the value of the yuan from 6.1 or 6.2 to the dollar to 6.4 to the dollar did not collapse the US and European stock markets. Furthermore, the change in the range of the floating peg to the US dollar did not devalue China’s currency with regard to its non-US trading partners. What had happened, and what China corrected, is that as a result of the QE money printing policies currently underway by the Japanese and European central banks, the dollar appreciated against other currencies. As China’s yuan is pegged to the dollar, China’s currency appreciated with regard to its Asian and European trading partners. The appreciation of China’s currency (due to its peg to the US dollar) is not a good thing for Chinese exports during a time of struggling economies. China merely altered its peg to the dollar in order to eliminate the appreciation of its currency against its other trading partners. Why did not the financial press tell us this? Is the Western financial press so incompetent that they do not know this? Yes. Or is it simply that America itself cannot possibly be responsible for anything that goes wrong. That’s it. Who, us?! We are innocent! It was those damn Chinese! Look, for example, at the hordes of refugees from America’s invasions and bombings of seven countries who are currently overrunning Europe. The huge inflows of peoples from America’s massive slaughter of populations in seven countries, enabled by the Europeans themselves, is causing political consternation in Europe and the revival of far-right political parties. Today, for example, neo-nazis shouted down German Chancellor Merkel, who tried to make a speech asking for compassion for refugees. But, of course, Merkel herself is responsible for the refugee problem that is destabilizing Europe. Without Germany as Washington’s two-bit punk puppet state, a non-entity devoid of sovereignty, a non-country, a mere vassal, an outpost of the Empire, ruled from Washington, America could not be conducting the illegal wars that are producing the hordes of refugees that are over-taxing Europe’s ability to accept refugees and encouraging neo-nazi parties. Nowhere in the Western media other than a few alternative media websites is there an ounce of integrity. The Western media is a Ministry of Truth that operates full-time in support of the artificial existence that Westerners live inside The Matrix where Westerners exist without thought. Considering their inaptitude and inaction, Western peoples might as well not exist. More is going to collapse on the brainwashed Western fools than mere stock values. 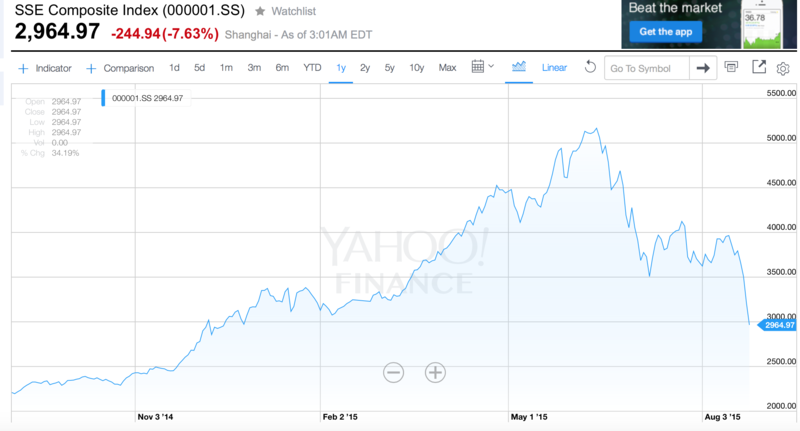 Financial Meltdown and the Rigging of the Shanghai Stock Market? The dramatic collapse of the Shanghai stock exchange has been presented to public opinion as the result of a spontaneous “market mechanism”, triggered by weaknesses in China’s economy. The Western media consensus in chorus (WSJ, Bloomberg, Financial Times) portend that Chinese stocks tumbled due to “uncertainty” in response to recent data “suggesting a downturn in the world’s second-largest economy”. Amply documented, financial markets are rigged by the megabanks. Powerful financial institutions including JP Morgan Chase, HSBC, Goldman Sachs, Citigroup, et al and their affiliated hedge funds have the ability of “pushing up” the stock market and then “pulling it down”. They make windfall gains on the upturn as well as on the downturn. This procedure also applies to the oil, metals and commodity markets. The Shanghai SSE Composite Index progressed over the last year from approximately 2209 on August 27, 2014 to more than 5166 on June 21st, 2015 (circa 140% increase); then from July 21st it collapsed by more than 30 percent in a matter of two weeks to 3507 (July 8). A further collapse occurred starting on August 19, in the week immediately following the Tianjin explosions (August 12, 2015) culminating on Black Monday August 24th (with a dramatic 7.63 percent decline in one day). Did the Tianjin Explosion contribute to exacerbating “uncertainty” with regard to the Chinese equity market? The evolution of the SSE over that one year period has nothing to do with spontaneous market forces or real economy benchmarks. It has all the appearances of a carefully engineered speculative onslaught, an upward push and a downward pull. The regulator said [Report July 3] that it would be looking into whether parties were mis-selling financial products. …. The China Securities Regulatory Commission (CSRC) said it would base its investigation on reports of abnormal market movements from the stock market and futures exchanges. …. Some reports have accused overseas investors of driving prices down by short-selling stocks on Chinese bourses, meaning they were betting on stocks falling. … Any criminal cases will be transferred to the police, the regulator said. The media consensus (as well as statements emanating from the Chinese authorities) was that Chinese financial actors rather than foreign banks could have been behind the process of stock market rigging: “Overseas investors have limited access to Chinese markets”. Market manipulation did not emanate from foreign sources, according to the Global Times. This assessment, however, does not take into consideration that Goldman Sachs, JP Morgan Chase, HSBC et al are major financial actors within China, operating in Shanghai through Chinese financial proxies in partner joint ventures. Regulators fined six major banks a total of $4.3 billion for failing to stop traders from trying to manipulate the foreign exchange market, following a yearlong global investigation. HSBC Holdings Plc, Royal Bank of Scotland Group Plc, JPMorgan Chase & Co, Citigroup Inc, UBS AG and Bank of America Corp all faced penalties resulting from the inquiry, which has put the largely unregulated $5-trillion-a-day market on a tighter leash, accelerated the push to automate trading and ensnared the Bank of England. Dealers used code names to identify clients without naming them and swapped information in online chatrooms with pseudonyms such as “the players”, “the 3 musketeers” and “1 team, 1 dream.” Those who were not involved were belittled, and traders used obscene language to congratulate themselves on quick profits made from their scams, authorities said. (Reuters, November 11, 2014). Goldman Sachs among other major financial institutions operates out of Shanghai since 2004 under a joint venture arrangement with the Beijing Gao Hua Securities Company. Another factor which has facilitated speculative operations on the Shanghai Stock Exchange has been the integration of the Hong Kong and Shanghai stock markets in 2014 under the so-called “Stock Connect” link. The procedure enables foreigners to buy Chinese A shares listed on the Shanghai exchange out of Hong Kong, with “limited restrictions”, namely full access to China’s equity market. These engineered upward and downward swings of the Shanghai Composite Index ultimately result in the confiscation of billions of dollars of money wealth including Chinese State funds provided by the People’s Bank of China to prop up the Shanghai Stock Market. Where does the money go. Who are the recipients of this multi-billion dollar trade? In response to the August meltdown, the People’s Bank of China “offered 150 billion yuan ($23.43 billion) worth of seven-day reverse repurchase agreements, a form of short-term loans to commercial lenders.”. This money was wasted. It did not result in reversing the meltdown of the Shanghai stock exchange. Geopolitical considerations are also relevant. While the Pentagon and NATO coordinate military operations against sovereign countries, Wall Street carries out concurrent destabilizing actions on financial markets including the rigging of the oil, gold and foreign exchange markets directed against Russia and China. Is the “possible” rigging of the Shanghai Stock Exchange part of a broader package of US actions against China which consists in weakening China’s economy and financial system? Does China’s financial collapse serve broader US foreign policy interests which include routine threats directed against China, not to mention US military deployments in the South China Sea? Are we dealing with “financial warfare” directed against a competing World economic power? It is worth noting that speculative procedures (rigging) have also been used in the oil and foreign exchange markets against the Russian Federation. Combined with the sanctions regime, the objective was to push down the price of crude oil (as well as the value of the Russian rouble), with a view to weakening the Russian economy. 1. The latter is one among several instruments used by speculators. There is no buy sell transaction of shares of company listed on the stock exchange: a bet is placed on an upward or downward movement of the DJIA. It’s an index fund: ask and put options.